A dozen "scholars" were installed in 1866, learning from a set of Nelson's school text books. The Inspector opened the school proper on 14th May 1867. In 1866 and Toongabbie was a new town, just four years old, a town with some people in it who wanted an education for their children. It was suggested that the town should have a public school. It was after all a post town and there were 65 young children in the area, forty of them under eight. This was a time of rural expansion. In the 1860's, Australian farm produce began to find a world market and selectors were pushing out into the rural areas. Then in 1863, gold was discovered at Stringer's Creek, and from the mines there they kept contact with the rest of the world through Port Albert - passing through Toongabbie on the way with packhorses and mules. People were soon settled at Toongabbie to set up stores and accommodation for travellers. The town was laid out and surveyed in 1864, and by 1866, they needed a school. By 1866, Cobb and Co. were running coaches from Rosedale to Toongabbie. The area was developing rapidly. 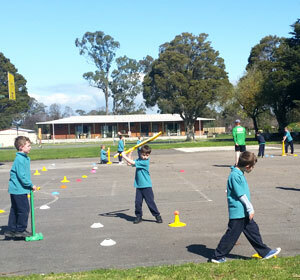 On their own initiative, the Toongabbie folk went ahead and rented a temporary building for their school. A dozen "scholars" were installed in 1866, learning from a set of Nelson's school text books. The next step was to build a real school. There was a proper procedure to follow, under the Common Schools Act of 1862. This Bill "for the better management and establishment of common schools in Victoria" had laid the foundations of the system. Under this law, all schools receiving State aid were to be called "Common Schools." There was to be no assistance for schools with an attendance lower than 40 - a rule which must have hit small rural communities hard. Toongabbie was fortunate in having enough young people to qualify for aid. The name "Common School" was not liked in Victoria, but the rules were strict and the Board insisted that each school display the title in large letters. The Committee had gone ahead on their own and was hoping that the Board would now lend it their "aid and power" - to the tune of one hundred and twenty pounds. The little building combined one classroom with a three-roomed teacher's house. It was built of wooden slabs and had an iron roof; the schoolroom was 20ft by 14ft. Fifty pounds for the school was to be raised by the local committee and twenty pounds would be needed for annual upkeep. It was proposed to charge a school fee of one shilling a week; this was before the days of free education.The actual cost of the first schoolhouse, according to the accounts, was £107.14.2d. This included the clock at one pound. The Inspector predicted an attendance of 30 and said that the nearest school was 12 miles away at Rosedale. He opened the school proper on 14th May 1867. A look at the drawing of the first school shows us that the founders were perhaps not ambitious enough. The little slab-walled building was soon too small; at any rate, it was soon superseded. The school roll went up and by the early 1870's, a bigger school was needed. This time there were 68 children within a radius of two miles from the school and the necessary forms asked for forty pounds from the State. In 1871, a new schoolroom was built on a site which later formed part of the railway station yard. This was a weatherboard building with a pine floor and a shingle roof. At this time the school fees were 6d per week for a child in the first class and a shilling for older pupils - which was cheaper than most schools. In 1872 the Great Education Act made Victoria the first state in the world to introduce free and compulsory education; gone were the school fees from this time on and the new Act may have increased the number of children at the school. Compulsory schooling was intended to do away with child labour, to make young Australians into good citizens - and maybe also to prepare them for making up their minds how to vote. The law was not always enforced - how could it be in remote areas? But it must have reminded parents that the school would give their youngsters a good start in life. Charles Edward Stewart was the head teacher here from 1873 to 1906. He was born in Britain and had taught there before coming to Australia in 1872. Mr Stewart had intended going to New Zealand, but he settled down at Toongabbie and spent the rest of his life in the area.When the railway came through the town in 1883, the school was in the way. The building was sold and a new school built on the present school site; this third building lasted until 1968. There were nearly always plenty of young people at Toongabbie; in 1920 there were 82 on the school roll and an assistant was appointed.Naturally enough, they needed more room; by the end of the year it was 90 children and three teachers, crowded into one room. 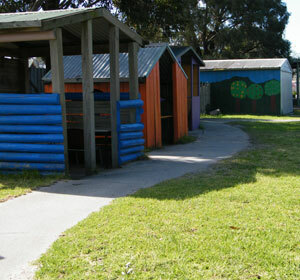 A shelter shed erected some years earlier was in use as a classroom by grades 3 and 4. In 1922 they were still asking for relief from the crowded conditions; they got an extra classroom by 1924 .It was not until 1938 that some sports facilities were provided at the school. A petition in 1932 sheds a little light on the town's history. It seems that by then the school enrolment was falling; the Public Works department proposed to take away one of the rooms from the school, to erect it at the Brown Coal Mine School .During the war the school had an underground bunker, just across the road. Electric energy, as it was known, was installed in the school in 1950. The 1883 school was still being used in 1967, the centenary year. 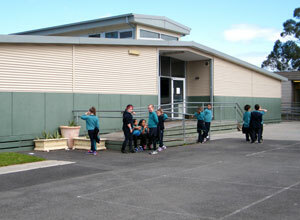 From then until 1989, there were two classrooms and two portable buildings. Since 1910 when the rail link from Moe to Walhalla was opened, Toongabbie lost its place on the direct route through Gippsland and the decline in student numbers reflects a decline in population. Gone were the hotels and lodging houses; gradually, Toongabbie settled into a country routine of farming and timber felling. 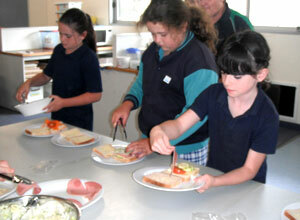 Toongabbie School has always had very good support from the community. For example, the Mother's Club provided a rain gauge, thermometer and globe for the school in 1962 and every year there was a record of more equipment and books supplied by the people of the town. The School Committee did its best to maintain and improve the grounds and visiting School Inspectors paid tribute to their efforts. Net enrolment in -1962 was 29 and this was typical of the 1960's to the 1980's.